Hello, hello Lindy’s lovers:) It’s snowing here already and so I stayed home and decided to experiment a little. I decided to do a pull string technique with Lindy’s sprays and oh, I am so happy with the result! So tell me honestly guys- what is it still out there you can’t do with Lindy’s? I think you can create loads of projects! I am gonna be honest with you, before making my project and filming it, I actually did a trial and I will show you the photos of my very first string pull technique trial in a few days on Lindy’s Creative Gang FB page. And since I did my trial on a regular piece of paper, you’ll see how different the effects are. Today however, I started by preparing my Lindy’s Starbursts sprays: Time Travel Teal, Bougainvillea Fuchsia & Hydrangea Blue. I also cut few pieces of quite thick white string- this was just string I had at hand, I was not overthinking it too much. Anyway, after preparing it all I shook the sprays well, unscrewed the sprayer cap and dipped the string into the bottles and let it soak up a little the paint. Then, one by one, I took them out, placed on the piece of paper, covered it with another piece of paper with a small opening cut out in the middle, and holding the top paper with my hand I pulled the string out. I repeated the process with each color. The last string I decided to pull from the edge which you’ll see clearly in my video. It was really hard to take a picture of the project, I had both hands busy and nobody around me to take a shot of what I was doing, hence the movie! For this project, I preferred to work on a piece of cardstock paper, which I later adhered to my art journal, this way I had a really flat surface to work on. The different ways to pull the string, either from edges of the paper or by making a circle-shaped incision in the middle of the paper you are covering the project with, give you different effects, which you can also see on the photos below. For the background, I added some stamping and some embossing with Lindy’s Obviously Black EP. 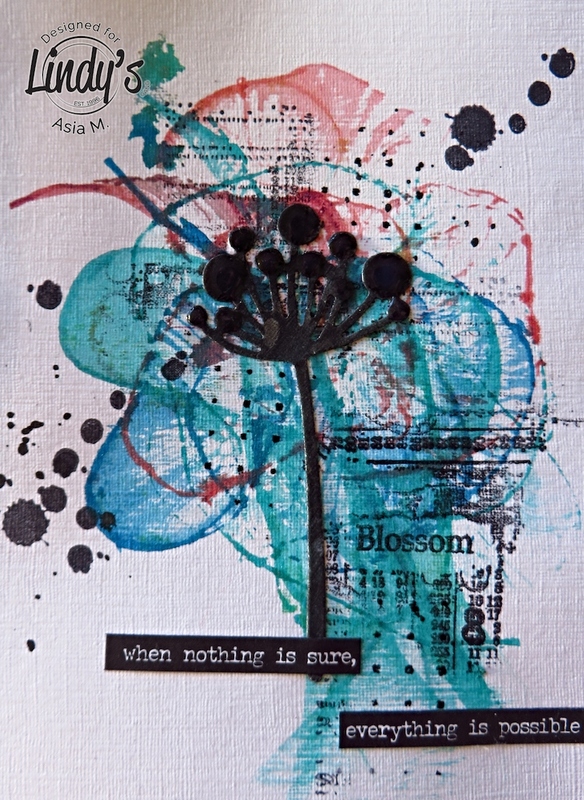 I added some splatters, but just a tiny, tiny bit and a Small Talk stickers by Tim Holtz. The die-cut flower was covered also by Glossy Accents (just the flowery parts). Absolutely LOVE this! Must try it too :) Thank you for the inspiration!